B&W Deloitte ist die aktuarielle Unternehmensberatung im Corporate Finance Bereich von Deloitte. Für unser Team an den Standorten Köln, Hannover, München und Wien suchen wir engagierte Verstärkung für die Beratung und Betreuung von Kunden in Deutschland und Österreich. Nach erfolgreichem Abschluss Ihres Studiums der Mathematik, Wirtschaftsmathematik oder der Betriebswirtschaft mit Schwerpunkt Mathematik oder vergleichbarer Qualifikation haben Sie idealerweise bereits 3-7 Jahre Erfahrung in einem vergleichbaren Umfeld bei einer Beratungsgesellschaft oder in einer entsprechenden Position in einem Versicherungsunternehmen, beispielsweise in den Bereichen Aktuariat, Risikomanagement, Produktmanagement, Controlling oder Revision gesammelt und wollen sich beruflich weiterentwickeln. Sie besitzen Kenntnisse der regulatorischen Anforderungen und ihrer Umsetzung und haben sich zum Aktuar (DAV oder vergleichbar) qualifiziert oder stehen kurz vor dem Abschluss. Zudem verfügen Sie über sehr gute Englischkenntnisse, die Sie idealerweise im Rahmen von Auslandsaufenthalten vertieft haben. Darüber hinaus besitzen Sie ein hohes Maß an Selbstständigkeit, Engagement und analytischem Denkvermögen. Sie freuen sich darauf, als teamorientierte und kommunikationsstarke Persönlichkeit mit offenen und hochmotivierten Kollegen zusammenzuarbeiten und bringen erste Erfahrung in der Mitarbeiterführung mit. Es erwartet Sie eine anspruchsvolle, abwechslungsreiche Tätigkeit bei leistungsgerechter Bezahlung in einem von starkem Teamgeist, offener Kommunikation und flacher Hierarchie geprägten Arbeitsumfeld. Im Rahmen regelmäßiger Fortbildungsmaßnahmen haben Sie die Gelegenheit, Ihr Wissen stetig auszubauen und zu vertiefen. Bitte übersenden Sie Ihre Bewerbungsunterlagen unter Angabe Ihrer Gehaltsvorstellungen und Ihres frühestmöglichen Eintrittstermins an Katrin Braun. Fragen beantwortet Ihnen unser Recruiting Team gern unter +49 (0)211 8772 4111. Job Purpose: To write daily entertainment news articles and features and support the editorial team. Writing several news articles and features on a daily basis. Attending entertainment events as a representative of Sugarscape.com. The candidate must have completed at least one work experience placement at an online title, although this does not specifically have to have been one based around entertainment news. Candidate should be bright, enthusiastic and willing to go the extra mile to make Sugarscape the best it can be – whether this involves attending industry events outside of work hours, or working morning and evening shifts for the site (which are paid on a p/h basis in addition to contract salary). Candidate should have a basic knowledge of Adobe Photoshop and iMovie, as some picture and video editing is required. Should also be confident enough to interview celebrities solo, and be bursting with original features ideas. This is a full on role – no making tea required – candidate will be an essential member of the team and therefore need to be willing to hit the ground running from day 1. Ideal opportunity for a graduate or equivalent. To apply, please send a copy of your CV along with 2 news stories written in the Sugarscape style, and a list of 3 features ideas for the site. Please click here to apply via Hearst Magazine's online form. Kerry Taylor Auctions is a leader in the auction world’s fashion niche, specialising in vintage fashion, fine antique costume and textiles. We have conducted many significant and highly publicised auctions, including important collections from the wardrobes of Audrey Hepburn, Diana Vreeland, Elizabeth Taylor and Princess Diana. The successful candidate will have the privilege of handling a wide range of vintage fashion- from historic antique pieces to fine haute couture. This is a rare opportunity to join our unique and world leading team. As part of our small and highly passionate team, you will be assisting the photographer directly and providing general support to ensure that sale deadlines are met. This role is physically intensive, requires you to be on your feet and to be able to lift and move heavy objects including mannequins. After training, at busier periods you will be required to act as photographer, taking and processing commercial digital images and ensuring they meet our high standards of professional consistency. Duties will also include the handling, steaming and dressing of vintage and antique garments in preparation to be photographed. The careful handling of highly valuable pieces is an important part of this role. Proficient knowledge of Canon cameras and studio lighting. Must be confident in using a Mac, Photoshop and Adobe Bridge. Proficient in image editing; specifically colour correction and cut-outs. Proven experience in digital photography and working in a studio environment. Ability to work independently and as part of a small team. Must have the ability to handle a high volume studio workflow whilst meeting tight deadlines and working under pressure. Detail oriented and extremely focused. Some experience in product photography for e-commerce. A keen interest in vintage fashion, textiles and historic dress. Please email your CV and cover letter to info@kerrytaylorauctions.com with the email subject: Assistant Photographer. Drafting articles, fact sheets, press releases, interviews, briefing materials and other similar items; Gathering of primary research material and checking background information; Monitoring and curating news sources; Developing web and social media content; Pitching news items; Additional tasks and responsibilities as mutually agreed upon. Excellent writing and communication skills in either English, French or Spanish. ; Creativity, versatility, high energy, initiative and discipline; Demonstrated interest in Juvenile Justice or Children’s Rights issues is a plus, as is general knowledge of International Human Rights Law; Strong research ability and command of the Internet; Minimum study level: university student of Communication Studies or Law; Good use of IT. Knowledge of social media, video editing and graphic design tools is a plus; Able to work independently as well as being part of a team; Ability to meet deadlines; Sharp attention to detail when proofreading or fact-checking. ls führende deutsche Agentur für Social Media suchen wir zur Verstärkung unseres Teams ab sofort einen Praktikanten (m/w) für den Bereich Vertrieb/ Marketing. Die Praktikumsdauer beträgt sechs Monate und das Praktikum wird in Vollzeit an unserem Standort in Leinfelden-Echterdingen absolviert. VICO ist in Deutschland der Marktführer für individuelle Social Media Intelligence Systeme. Eingebunden in technische Forschungsprojekte erarbeitet VICO Systeme für die Big Data Welt von Morgen. Das Kundenportfolio der VICO GmbH reicht branchenübergreifend vom innovativen mittelständischen Unternehmen bis hin zu weltweit agierenden Konzernen. Am grünen Rand der Kultur- und Szenemetropole Stuttgart, arbeitest Du in einem jungen Team aus Querdenkern und Spezialisten, die nicht nur bei der Arbeit gemeinsame Sache machen. Du hast noch Fragen? Dann kannst du uns gerne unter 0711 78 78 29-11 anrufen. Before the digital internet became widely used, the only job opportunities for the people who wanted to work from home were either a stay-at-home parent, an artist or a craftsman. For those who wanted to earn more money, the only way to do it was to get out of the house and get a nine-to-five job. But nowadays with the help of modern technology, a whole new job market has opened up. When people think about working from home, many imagine sleeping in late, lounging around in their pajamas and long leisurely afternoons. But what people need to realize is that even though working from home offers a great amount of flexibility, it is still a professional job and it needs to be treated as such. Working from home is so much different from working in an office environment. This means that it is not for everyone as some challenges come with it. The people who are going to be satisfied with this kind of job are the ones who manage their time excellently and are strongly self-disciplined with their tasks. Despite that, more and more people choose the work-from-home kind of lifestyle. 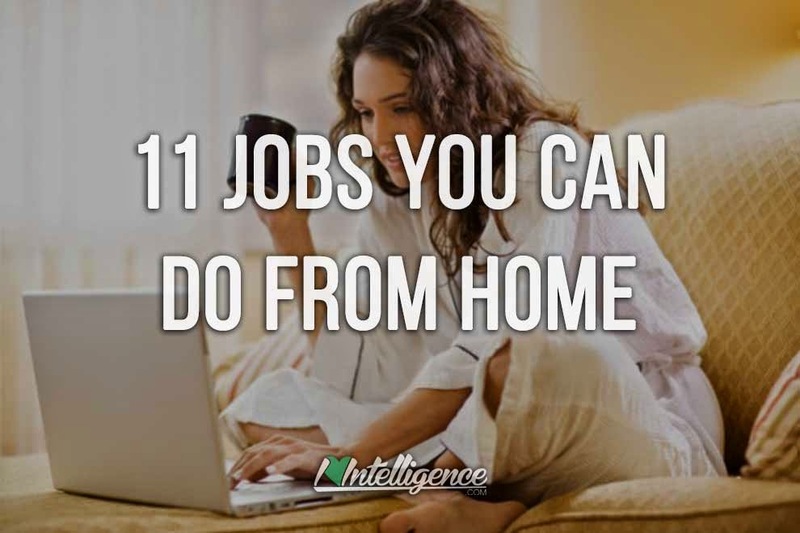 If you are interested to find out which are the most popular jobs you can do from home, we have done a list so you can get ideas and ways of starting your own freelance career. If you are interested in computers and have a creative nature, this may be the job for you. Building and redesigning the websites we use every day requires a web designers’ creativity and technical skills. As so many companies are taking their businesses online, web designer is a highly needed profession these days. You do not usually need qualifications to become a web designer. As the software developers’ job market is expanding vastly, there is always place for more people in this line of work. To become a software developer, you have to be creative at solving problems and following technical plans. Graphic design is a job that requires IT and drawing skills. With the use of lettering and images graphic designers communicate information and ideas. Some graphic designers are self-taught, others enter the industry with talent alone, but either ways, it is a job that can be done from a home environment. If you love computers and have organizational skills, why not consider getting a job as a data entry clerk. There are many job opportunities in that area. You can do your work from home and have flexible working hours. If you have good communication skills and are good at persuading and negotiating, why not consider a career as a sales representative that you can do from home? There is a big variety of subjects that you can choose from if a career in teaching sounds good to you. Working from home is a good option because technology nowadays provides so much possibilities for us. For example, you can use a web cam and a good internet connection so that you teach students online. Being bilingual is always an advantage in life. There are tons of opportunities for bilingual people, so if you are one, there is plenty of work for you. If you prefer working from home, a job as a translator might be just what you need. A job as an editor is really common these days because there is a huge number of writers and therefore, a huge number of editors is needed. This kind of job may involve editing posts for big blogs before publishing, editing web site content, books, e-books, magazines, etc. If you love writing and sharing your ideas with the world, a job as a writer might suit you perfectly. There are different types of writers and there are various opportunities. Blog owners are always searching for people with writing skills to write articles for blogs as well as writers for website content, technical documents, product reviews, etc. If you understand the importance of living a healthy lifestyle and you love training in the gym, why not consider a career as an online personal trainer? Having good communication skills will help you find new clients online. You can even consider to market yourself on YouTube and social media websites as you will approach more people. A strong mindset and excellent analysis skills are musts for succeeding in the world of Forex. If you are a person with perfect numerous, communication and IT skills who loves a risk, a job as a Forex Trader may suit you perfectly if you want to work from home. The online freelance market is a big ocean of opportunities for those who prefer working from home rather than in an office environment. Finding something you are skilled at and the will to work hard towards your goals will most definitely help you find someone who is looking for your service.